So let’s talk about wind, not the breezy hill top walk kind, the kind that leaves your stomach bloated like a helium filled party balloon, the kind that causes pain and discomfort, the kind that leaves you needing to rush off and, err ‘release’ in private. Not to mention the kind that needs some cover noise in a public loo! Is the TMI for you? Well tough because IBS affects one in five people in the UK. I’ve had it on and off for years since having children, I think the early years combined with going back to work set off the stress and left me with little time to eat properly or mindfully, in-between meetings, pick up drops offs and bedtime. Of course IBS affects everyone differently and I’ve tried several things to help, but nothing seemed to make much of an inroad. Some think IBS is a result of food and drink moving too fast or too slow though gut, which to me makes sense. It’s unrealistic to look for a magic cure and one size fits all miracles, so you have to try and find what works for you. So I’ve been using Symprove for 12 weeks now and for those who can’t wait to know how I got on; it worked beautifully. You just swig back a small cup (which comes in the box) each morning and each cup contains 10 billion live bacteria, simple. You keep it in the fridge once opened, so every morning before the children were awake I plod to the fridge have my dose and get cracking with my children’s breakfast and packed lunches. Even I could manage that! 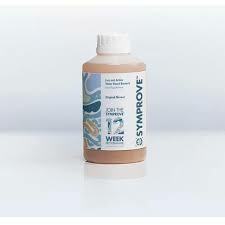 Symprove is a water-based multi-strain supplement that contains 4 unique strains of live activated bacteria. These include: L. rhamnosus, E. faecium, L. acidophilus, and L. plantarum. Normally a healthy gut would already contain all four of these, however when it doesn’t, it can soon become unbalanced. Is there are science or facts to back up the product? 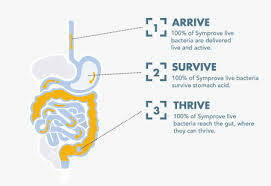 Yes; breakthrough independent research by University College London (UCL), where they tested mainstream probiotics on sale in the UK, shows that Symprove is the only product they tested that could meet all three challenges of being able to arrive, survive, thrive and colonise in the gut. To me it made sense that my gut needed help in doing its job, eating less and more frequently and having better diet has helped, but you wouldn’t ride a bike with a rusty chain without adding some oil or grease to give you a smoother more comfortable ride, would you? I like a simple no brainer solution and doing this each morning became s second nature. I longer feel as if I’ve swallowed a party balloon and my gut feels as if normal service has been resumed, at long last! 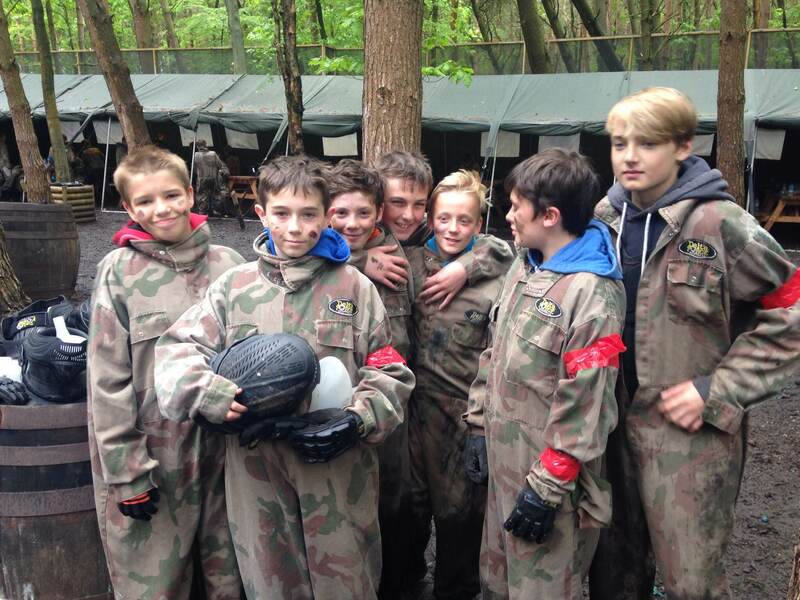 Sunday Forest Delta Force Paintball Games – go TEAM! Paintball in a forest on a Sunday morning? No thanks. But it was for my children, mainly my eldest son’s 13th birthday; yes a teenager, I can’t hardly believe it! As they get older parties tend to fizzle out and it tends to become a sleepover, the movies or some sort of activity. 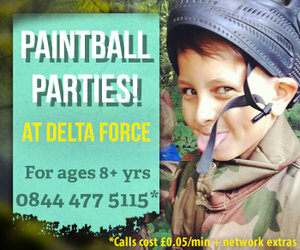 This time we opted for paintball with Delta Force Paintball. “Oooh controversial” I can here some of you say, even some of my friends said “‘too violent” and “it’s guns” were some of the things that were said. My motto in life has always been don’t knock it until you try it, so we did. As Mum’s of boys you’ve got to embrace your inner ‘wild thing’, it is so not my thing to run about in a forest being splatted with paint balls but it’s not his idea of a good time to have boozy gossipy lunch for hours with girlfriends, so you have to put your self in their shoes or as it happens on this occasion walking boots. Driving my son and four friends to the venue you could just feel the excitement and anticipation, building the tension even more was the long rough country road to get there! Once we arrived the set up had me, the play zone themes are better than any big theme park I’ve been too and the fact there are many other groups of adults, teens and children there pretty much reassure the ‘worrying’ mother in me that it was all going to be OK. The staff take safety of all the guests seriously and the safety briefing of what was and was not allowed was clear and direct (3 metre distance to shoot at all times – no paintballs aimed at the head) turning down my worry-o-meter even more; after all I was looking after other people’s children too. Once kitted up, paintballs distributed and helmets adjusted and checked by the staff, off they went into the game zone, which is all fenced off and only gamers are allowed in. I sat on one of the benches with a coffee and a hot water bottle which are provided free of charge to parents sitting and waiting. There are several zones the each group takes turns in playing and just over 25 minutes later my son and his friends arrived back onto the holding area, red face, laughing their very sweaty heads off! Their verdict “totally awesome” It’s so more boys own famous five fun than scary shoot em up. Inside each game zone each theme had various abandoned double deckers buses, taxis, barrels, piles wood hides outs walls, black taxis, castle made out of wood. It was safe, it was fun and in was interesting. Most of all it was active, new and required skill. The boys had a great time with each other and learned some teamwork skills along the way. 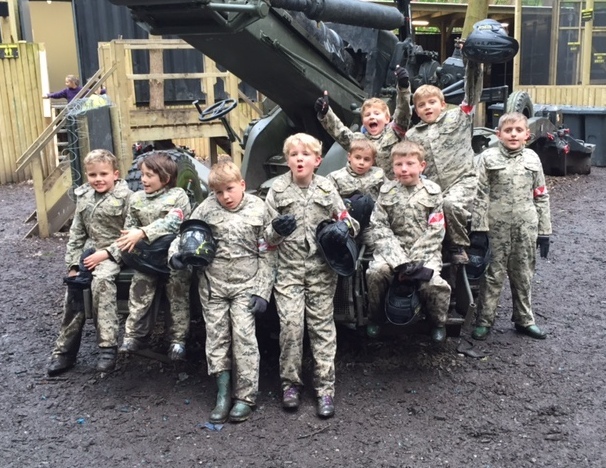 Punctuated by pizza at lunchtime (you can take you own food and drink or pre-order pizza) a full, full on day of paintball was thoroughly enjoyed by all. My youngest wanted to get in on the act, but I wondered is 8 was too young, not at all I was reassured by the staff. Even for an 8 year old, who do half a day, fully kitted out with overalls and goggles and helmet which are checked before they enter the games zone. For the little ones, they get ready filled paintball shooters, so they don’t have to fiddle about filling up. Completely separate game zone for 8 year old with no other adults. With nine friends all raring to go off they went and again came back laughing and joking about who got splaatted on the bottom! professional and helpful staff, who know what they are doing and still as popular as ever with up to 400 people every weekend and lots of corporate stuff in the week. There are several sites throughout the UK but this one my boys definitely want to visit again and next time I’m going to joine them!